This cask seems to have been split with half being bottled for the US market and half for a whisky festival in Italy (both by James MacArthur). Nose: Butter, brown butter, light maple syrup. Bananas, baked apple pastry, some polished wood and a touch of honey. Gets sweeter as it sits and more honeyed as well. Not a whole lot of change with water–maybe a little pine resin. Palate: Hot but surprisingly drinkable. Very much as on the nose, except the sweetness arrives faster and there’s more rich malt here and the wood is toasted rather than polished. Really quite lovely. Water makes it brighter and spicier and there’s some pepper too now. Finish: Long. The wood gets more assertive and spicy and presents a nice counterpoint to what’s gone before. With water there’s less of a transition from the palate to the finish. The pine resin from the nose shows up here too and there’s also a lingering roasted malty thing on the sides of my tongue. Comments: I am a little disappointed that water didn’t pull out any tropical fruit notes. I wonder if they might develop as the bottle gets some air; or maybe I didn’t get the balance of water just right. Still, this is quite good. Obviously a refill cask–this is very far from a sherry bomb. 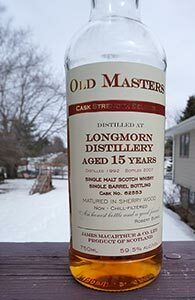 This entry was posted in -Whisky by Rating, 85-89 points, James Macarthur, Longmorn, Whisky by Bottler. Bookmark the permalink. Here again is the link to Michael’s review. We seem to have found fairly similar notes in it (his chocolate is my brown butter, I think). We gave it the same score, for what that’s worth. I definitely need to eat much more brown butter. Drinking this again tonight, and as my share of this split comes to an end I am very pleased that I went back to the store and got myself another full bottle. Tonight I might go a little higher with the score. Florin and I drank this last night too, actually. I don’t know if it’s the oxidation at work, but it was really good this time around. I’d nudge my score higher too. And here is my brief take – thanks for the split! Serge reviews a sibling cask from James MacArthur today: cask 62552 in fact, the same age, almost identical strength and bottled the same year. His seems to have been much hotter and woodier but he liked his about the same.